I first noticed that I was losing more hair than usual when showering or combing my hair and that my hair seemed to be thinning all over at the age of just 18 (I am now 56). Alarmed at the thought of losing my precious locks, I then spent many years embarking on potential treatments to save my hair. This included weekly visits to trichologists, having electric stimulation treatments, using coal tar like solutions and shampoos. Nothing seemed to help though. Eventually, I saw an advert for a clinic which seemed to offer a cure – I visited the doctor there and was diagnosed as being suitable for the treatment. Armed with my ‘miracle cure’, I religiously used it for a month, but there was no impact and it was very expensive – so I decided to move elsewhere. Then one day, whilst travelling on holiday on a plane, I saw an advertisement in the in flight magazine for Nourkrin® – so I thought I would give it a try. 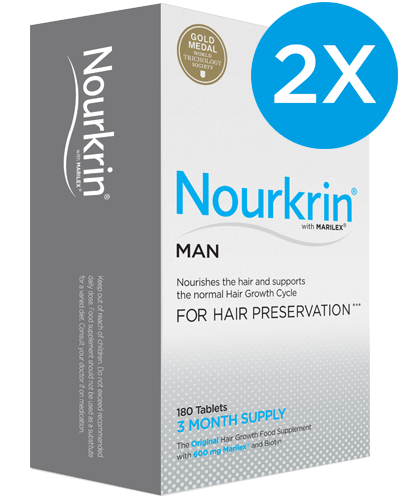 I started on the Nourkrin® Man hair supplement tablets on a daily basis and I was delighted with the results it gave after only one month of use – my hair seemed thicker and more manageable and my scalp less visible. I have continued to use it ever since and would not be without it. It’s easy to use and makes a real difference. 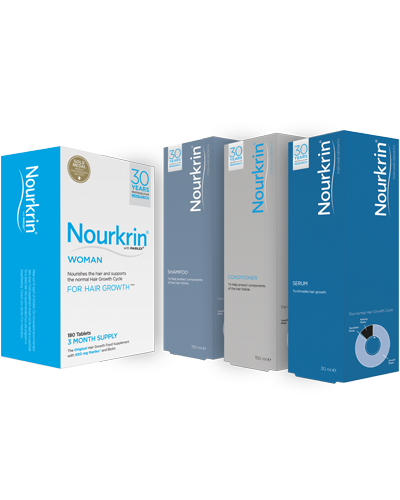 I feel more confident in the way I look and with my hair – THANKS NOURKRIN®!